Parents have a very important job to do and that job is to pass on the cultural legacy of the great movies we watched as children to our own kids. 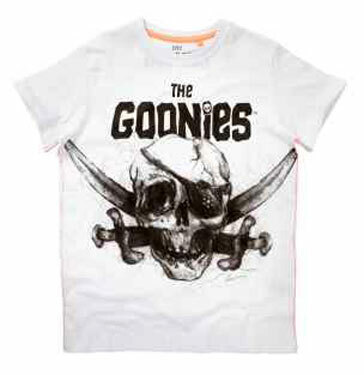 Chief among those movies is The Goonies, which is yet another thing that Next have cannily licensed to add to their extensive range of pop-cultural t-shirts. This one has a One-Eyed-Willie-esque skull and crossbones on a white background and is available for ages 3 – 16. The t-shirt costs £10-£15 depending on the size. Take a closer look here.